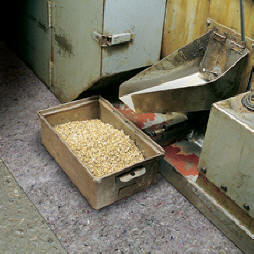 This Industrial Absorbent Rug is made from recycled material. The Rag Rug industrial absorbent floor mat is ideal for absorbing the grunge from oil, coolants, solvents and water without our industrial rugs looking dirty. Industrial absorbent rugs are made from recycled polypropylene and acrylic fibers, making it a great choice for use in areas where steady foot traffic might wear out an ordinary mat or rug that's become soaked with overspray. Because the Rag Rug Industrial Absorbent Mat stands up to high traffic abuse longer than regular mats, you can use it longer, which saves you money. 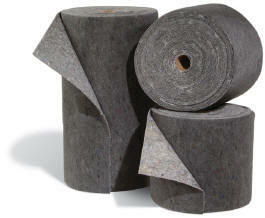 We offer recycled rag rugs in two different width rolls or in 18 inch square pads. Our industrial recycled rag rugs are made from recycled material. Absorbs oil, coolants, solvents & water. 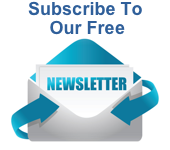 We Appreciate You at Absorbents Online!